*Food security is a condition in which all people, at all times, have physical and economic access to sufficient, safe and nutritious food to meet their dietary needs and food preferences for an active and healthy life. Source: CICH graphic created using data adapted from Egeland GM, Pacey A, Cao Z and Sobol I. Food insecurity among Inuit preschoolers: Nunavut Inuit Child Health Survey, 2007–2008. CMAJ February 23, 2010 vol. 182 no. 3. http://www.cmaj.ca/content/182/3/243.full -accessed July 17, 2017. In households where children were severely food insecure, 90.4% of the children went hungry; 75.8% of the children skipped meals; and 60.1% of the children did not eat for a whole day in the previous year. In households where children were moderately food insecure, 85.1% of the children’s primary caregiver worried that the food would run out; 95.1% fed their children with less expensive food; and 64.3% of the children did not eat enough because there was no money for food in the previous year. 1Egeland GM, Pacey A, Cao Z and Sobol I. 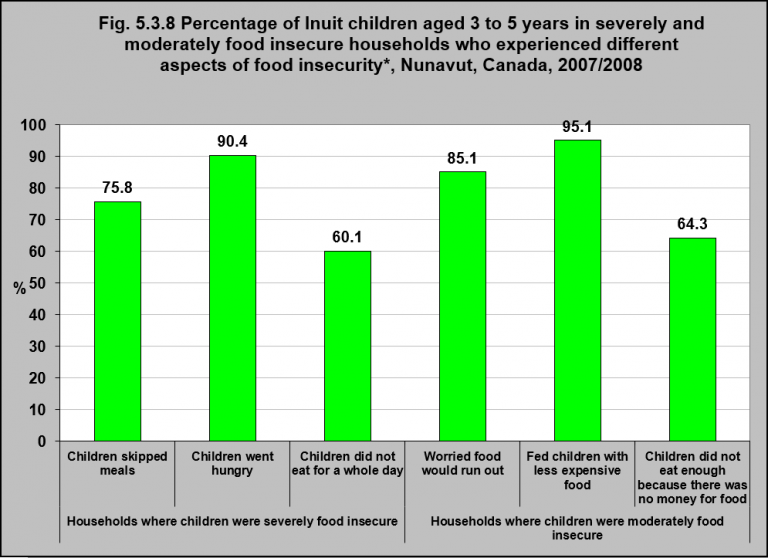 Food insecurity among Inuit preschoolers: Nunavut Inuit Child Health Survey, 2007–2008. CMAJ February 23, 2010 vol. 182 no. 3. http://www.cmaj.ca/content/182/3/243.full -accessed November 17, 2017. Food insecurity can be experienced in a variety of ways, from skipping meals, to substituting healthy foods with lower cost and less nutritional foods, to going hungry. The majority of Inuit children aged 3 to 5 in food insecure households have experienced all of these aspects of food insecurity as shown in the figure.